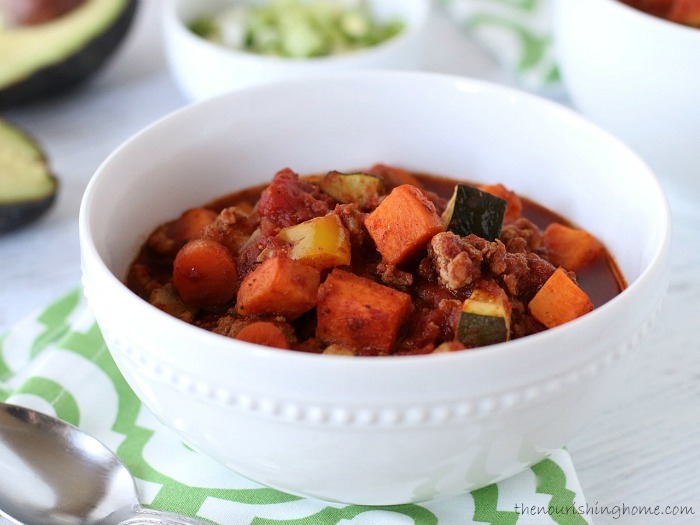 Whether you’re taking The Whole30 Challenge or not, this bean-free slow cooker sweet potato chili is certain to become a new family favorite. 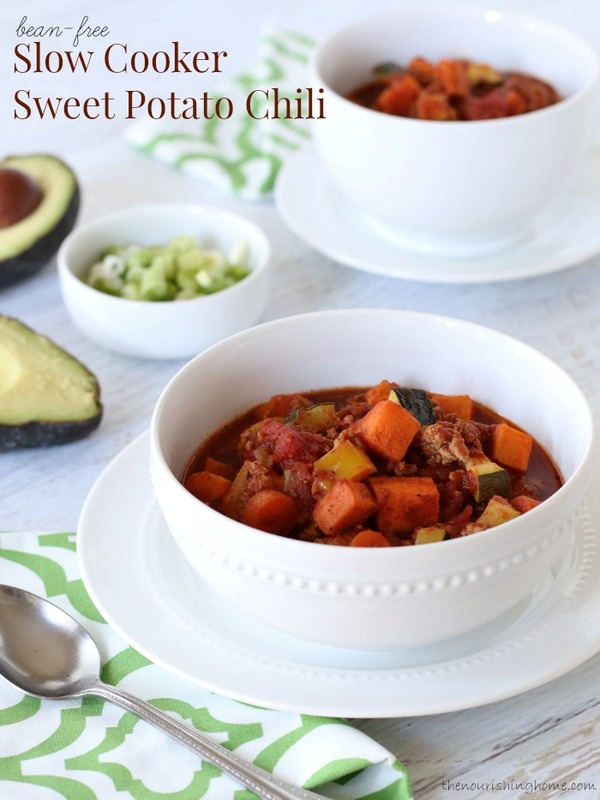 The combination of a spicy, meaty tomato sauce paired with the subtle sweetness of creamy sweet potatoes and an assortment of veggies creates an absolutely incredible chili. Talk about a bowl full of healthy flavor! 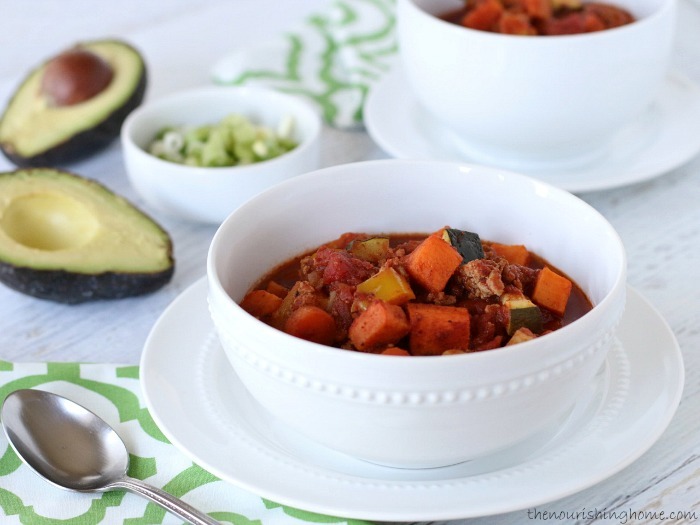 To create this classic wintertime comfort food in a bowl, I started with with my original Turkey-Veggie Chili and tweaked it to omit “the magical fruit” without changing its rich hearty flavor. In fact, we find this new new bean-free version to be even more flavorful! Of course, the best thing about this tasty recipe is that your slow cooker does most of the work. Just brown the meat and toss in the rest of the ingredients and go about your busy day knowing dinner will be ready without a lot of fuss. In fact, if you meal plan, you can schedule time to brown the meat ahead of time and then refrigerate or freeze it so it’s ready when you are – a definite time saver! Oh, and one more bonus – this recipe makes a lot of chili! I always love it when I can get two meals from one cooking session. Simply store leftovers in the fridge for up to five days and reheat to enjoy. In a large skillet over medium-high heat, sauté the onion in one tablespoon of olive oil for 1-2 minutes, until fragrant. Then add the ground beef (or turkey) and sprinkle with one teaspoon sea salt. Continue to cook until meat is cooked through. Add the meat mixture to a 6-quart slow cooker. Then add all of the remaining ingredients, except the zucchini. Stir well to combine. Cover and cook on High for 5-6 hours or on low for 7-8 hours. Be sure to add the cubed zucchini during the last hour of cook time, if using. Time-Saving Tip: Sauteeing the onion and ground meat together prior to slow cooking increases the chili's depth of flavor. To make it quicker to put this recipe together, you can do this step ahead of time and keep the meat in the fridge (up to 3 days) or freezer (up to a month) until you're ready to make this recipe. I wish I had a warm bowl of this right now! Rainy day comfort food. This might be a silly question, but I bought an eggplant that I don’t really know how to cook (all my previous attempts have been unsuccessful). Could it be added to this chili? If so, would you add it with/instead of the zucchini at the end or should it cook the whole time? Thanks so much, Kelly. I chickened out on adding the eggplant because I was concerned about it adding too much of a bitter taste. I will still find a way to use it, though. But, I had to tell you, this got great reviews from my whole family, including my father-in-law who is generally a very tough critic when it comes to healthy food (Cheetos are a basic food group to him). So, hooray for that! Thank you for this and all your recipes. I love your site. On this rainy day in March, I am making this for the first time, but don’t have the all-purpose herb seasoning. Can you recommend what seasonings I should substitute?? Hi, Julie. Yes, here’s what typically in All-Purpose Seasoning blends: onion powder, garlic powder, parsley, thyme, celery seed, basil, oregano, sage and coriander. Just wanted to let you know that I made this last week and it was awesome! Have never cooked chili with sweet potatoes before and it turned out so good! I also added a few extra chili spices and honey. My husband loved it. Thanks for posting! Do u have nutritional information for this ecipe? Stirred in some mashed avocado to everyone’s bowl since we can’t have sour cream or cheese…yum! Has anyone tried freezing this? Would love to “cook once eat twice” but not sure how well sweet potatoes freeze? Fantastic recipe. Easy to make and delicious. My husband loved it and he is a foodie so really pleasing him when it comes to meals isn’t always easy. He even served to one of his friends down at the fishing pier and told me to remember this recipe. Thanks for sharing. Thanks so much for taking the time to leave a kind note, Dona. I’m so happy your husband and his friend enjoyed this recipe! 🙂 Appreciate you! How would I make this a non-slowcooker recipe? 🙂 I’m one of those people that doesn’t plan ahead enough to get it all in the pot when it’s the right time. Thanks! My family LOVES THIS CHiLi! 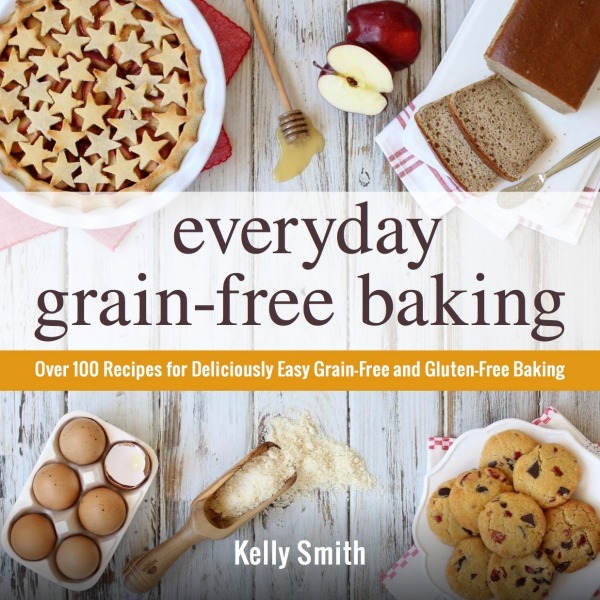 Thank you for such a delicious and healthy recipe! !